Paul Novarese and David Kudrav present... Train pictures! Columbus is a big railroad town. 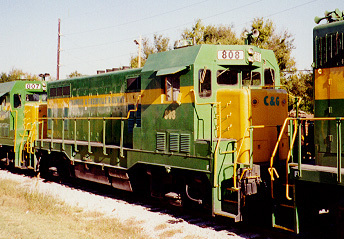 It is served by Burlington Northern Santa Fe, Norfolk Southern, Kansas City Southern, Columbus and Greenville Railway and Golden Triangle (a subsidiary of CAGY Corp; CAGY Corp is 94% owner of Columbus and Greenville Railway -- for more info see CAGY Corp). I, David, have been to Columbus exactly two times. For more information on railfanning columbus, see Derrick's RR pages. Derrick is an employee of CAGY Corp--both webmaster and locomotive engineer. Ex-Burlington Northern, now BNSF shanty. Note the safty slogan on the building. Ex-Santa-Fe, now BNSF locomotive idles just across the tracks from the shanty. Columbus and Greenville locomotive, parked in the yard. Note the color scheme--C&GY has about 100 different schemes (seems like whatever paint was cheapest the day they decided to paint their locos is the color they turn out). This was one of four loco's parked together (and sharing this particular paint scheme). 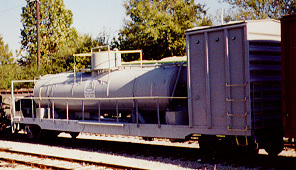 A C&GY maintainance car in their yard. Another one of the four locomotives that were daisy chained together and painted the same colors. An old passanger car. C&GY collects these things (it seems--they have almost as many passanger cars as paint schemes--and every two or three passanger cars have different paint schemes!). C&GY's shops in the background (a (former?) 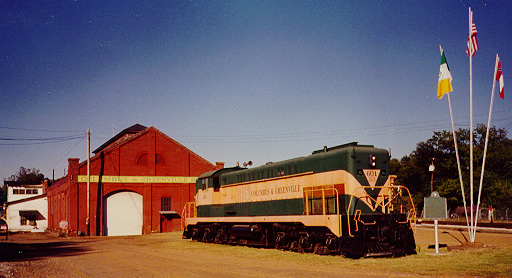 roundhouse); their 1st (now retired) locomotive; the main line is in the background. Also note C&GY's flag. Thats all the Columbus picture's we have; but there are plenty more to take! Best railfanning bet is to get a Columbus city map at a gas station (make sure it shows tracks before purchase!). C&GY had some serious 'no tresspassing' signage, so stay on public land when photographing. Tell us what you thought of our site. Send mail to us. Fine print: Questions? Comments? Concerns? E-mail Us! This site was designed to be as browser neutral as possible. We encourage the use of alternative/lesser known internet browsers. David Kudrav and Paul "Nova" Novarese retain most rights to all photos contained within this site and are the photographers of all photos contained here-in, unless otherwise noted. None of the photos may be used for commercial purposes without written permission. None of the photo's may be used on any other web site without written permission (which is likely be granted). This site Copyright 1998/1999/2000/2001/2003, Paul Novarese and David Kudrav.